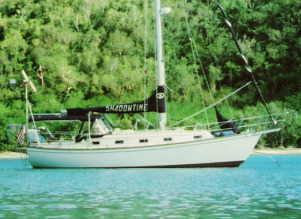 How is living on a sailboat frugal? You notice any utility, or telephone lines that are attached to our boat? Don't look too hard, you won't find any... you see part of the cheap sailboat lifestyle is the fact that anchoring is free. At this particular anchorage, we are very close to a five star resort that charges $500-$600 per night, I wonder if that included food? Who you think had the better view, us at anchor, or the view from a hotel room? In our introductory page to living aboard a sailboat, I noted that a cruising sailboat was like a floating RV... with one big exception. We are not tied to shore power and make all the electricity that we need from the when generator that you see on the rear of the boat,...and the solar panels that are on top of the Bimini... the canvas that protects the cockpit from the sun. Now, in certain locations, we did stay at a dock and you had to pay rental that would be equivalent to staying at an RV park. 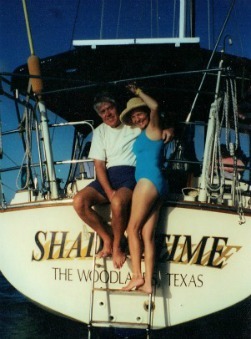 About 90 to 95% of the time, we were at anchor and totally self-reliant for our power needs. We ran the engine for five minutes a day while at anchor... this provided us the hot water that we needed for our showers prior to cocktail hour. Living on a sailboat is not only cheap...it's also very easy on the environment... no charge for the sun and the wind, and you always have a gentle breeze in the Caribbean. Our wardrobe was pretty basic, what you see is what we wore everyday... my wife added a cotton cover up, I hat for me, we both wore Teva sandals... they are waterproof and handy when you drive your dinghy to the beach. I never had more than two shirts with collars, for church and the occasional evening meal... stop and compare that to the cost of buying suits and dresses, dry cleaning costs and you can quickly determine that sailboat life is very cheap. We usually went ashore to use a laundromat, sometime we use the dryer... other times we hung our clothes along the rail. Most of the meals on Shadowtime were prepared on board... 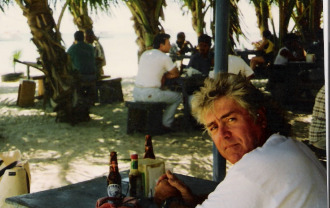 However in certain places, frugal sailboat living included meals ashore... this is a beach bar restaurant on the Isle of Margarita, Venezuela. They had two things on the menu fried calamari or fresh fish... the fish we saw delivered by the fishermen on an almost daily basis. Our total bill, including a couple of beers apiece, was always less than five dollars... they say living on a sailboat was cheap.